Mountain Lion That Hid Out Under LA Home Appears To Have Left : The Two-Way P-22, as the mountain lion is known, typically lives in Los Angeles' Griffith Park. Attempts to dislodge him from under a home Monday failed. 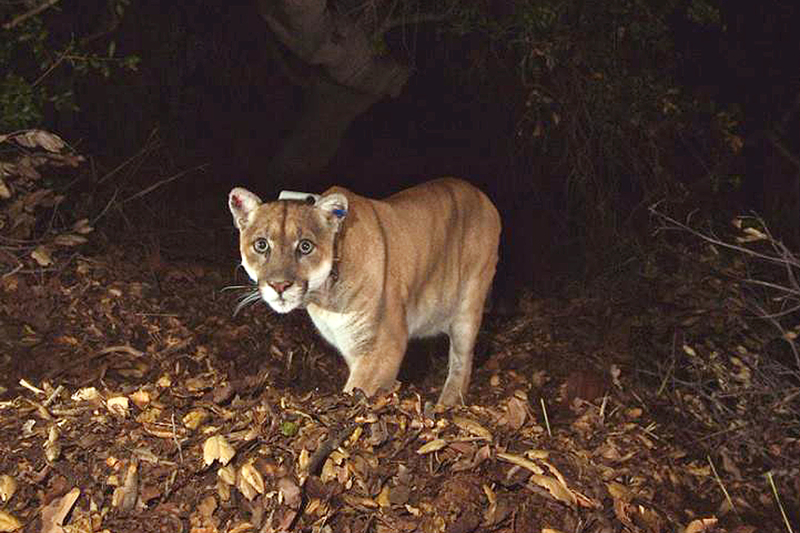 The mountain lion known as P-22 is seen in Los Angeles' Griffith Park in November 2014. He hid out for a time in the crawl space of a Los Angeles home. The mountain lion who spent Monday night under a Los Angeles home despite authorities' best efforts to dislodge him appears to have left on his own, a wildlife official says. There is no sign of P-22, as the tagged mountain lion who lives in Los Angeles' Griffith Park is known, in or around the crawl space under the house in the Los Feliz neighborhood, Trevor Pell, a warden with California's Department of Fish and Wildlife, said. P-22, as we've previously told you, has his own Facebook fan page and at least two Twitter accounts. "The cougar had padded out of the woods of Griffith Park sometime after midnight and taken refuge in the dark, shallow space under the contemporary, white-walled home of Jason and Paula Archinaco. "By midday, two workers installing a security system as part of a home renovation climbed into the crawl space. One worker quickly came uncomfortably close — eyeball-to-eyeball close — with the cat. "The workers quickly ran upstairs to alert the owners, who called the city, which then contacted the state." They tried a host of methods to lure P-22 out of the crawl space: a tennis ball launcher, prodding him with a long pole, even shooting him with bean bags. Nothing worked. At 10 p.m. local time, officials from Fish and Wildlife said they'd let P-22, who was fitted with a GPS collar about three years ago, leave on his own. P-22, if you remember, was made famous by a photograph of him in front of the Hollywood sign that was taken in 2013 by a National Geographic photographer. Last year, the mountain lion recovered from eating rat poison and from mange. He now appears healthy. Homeowner Jason Archinaco said he and his wife already have three cats and were considering getting a fourth — "but not this way."